Cross country runners aren’t imposing figures, and Peter Morris knows that. 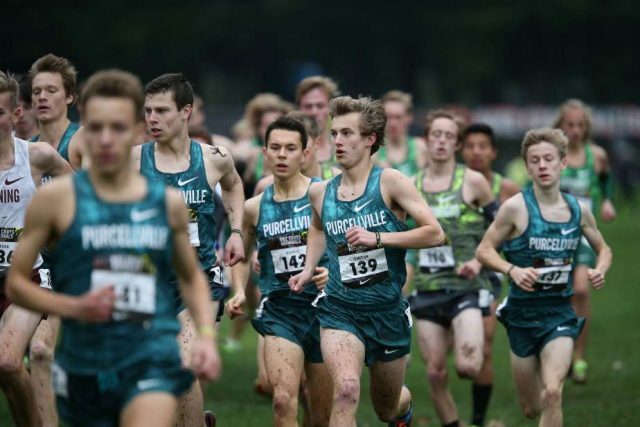 The Loudoun Valley guys couldn’t walk up to the rest of the Nike Cross Nationals field, stare everybody down and expect a response, but Morris knew if they could just be themselves on Portland, Ore.’s Glendoveer Golf Course, everyone would have a good reason to be scared of them. Like an alligator’s grin, a Viking’s laugh was a sign of danger to come. It wasn’t quite that easy, but it was that straightforward. 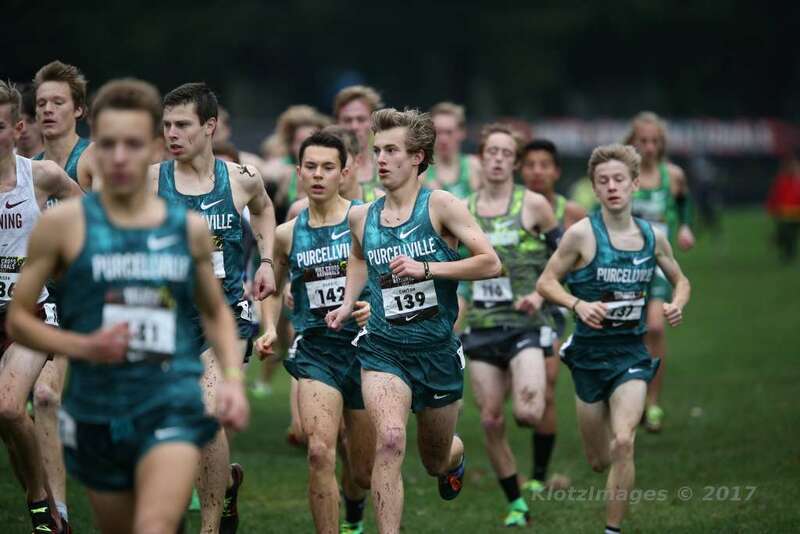 Hard work, smart training, bonding and some insight from Morris’ experience racing here last year all went into what turned out to be the most dominant boys’ team victory in NXN’s 14-year history as the high school team cross country championship. 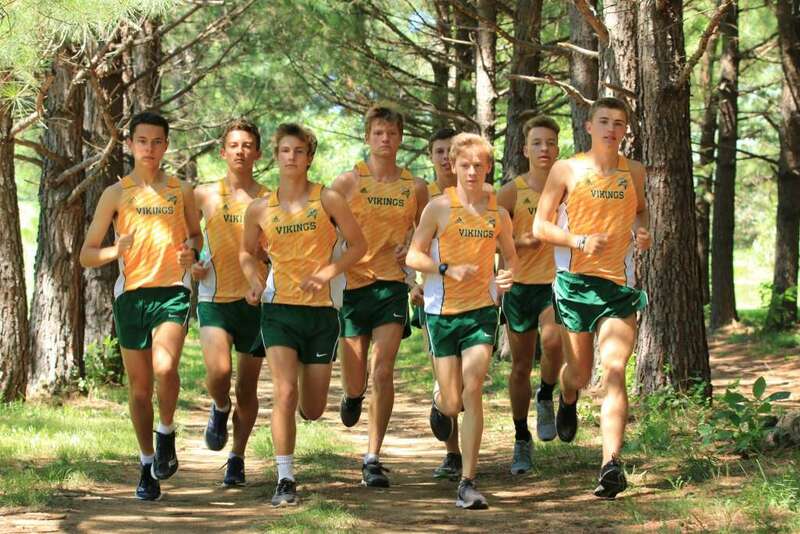 The Loundoun Valley top eight run their home course at Franklin Park in Purcelleville. From left: Peter Morris, Jacob Windle, Chase Dawson, Noah Hunter, Kevin Carlson, Conor Wells, Colton Bogucki, and Sam Affolder. RunWashington photo by Ed Lull. As last season came to a close in North Carolina, Loudoun Valley’s disappointment felt cushioned by potential. Though the Vikings failed to make Nike Cross Nationals, they were on the cusp. They made up ground on a team that had beaten them soundly seven weeks earlier and one junior, Peter Morris, had qualified for the finals with another, Colton Bogucki, one spot away. Jacob Hunter, just a sophomore, was 20th. With all of those runners and more returning, the clouds that hung over the team started to fade. Then, in December, they parted. Jacob Hunter got a message from a kid he knew from Pennsylvania.